Captain America and Iron Man disagree with each other on the new UN policy on superheroes causing a divide between the superheroes. The latest of the Marvel offerings is Captain America: Civil War (2016) telling of the rift between Captain America (Chris Evans) and Iron Man (Robert Downey Jnr) and leading to conflict amongst the Avengers. The film starts with a flashback to 1991 to Siberia, with the Winter Soldier (Sebastian Stan) repeating a number of Russian words spoken to him by a HYDRA representative reading from a mysterious red book. Following this the Winter Soldier mounts a motorbike and then after pursuing a car causes it to crash with the Winter Soldier obtaining some intravenous bags with a mysterious blue serum. These are then given to a Hydra employee. We then return to the present day where Captain America, Scarlet Witch (Elizabeth Olsen), Falcon (Anthony Mackie) and Black Widow (Scarlett Johansson) are in Nigeria pursing a ringleader and his followers. In a number of fast paced scenes they hunt down and fight the bad guys counting them down Deadpool (2016) style in their bid to obtain a biological weapon. You can almost feel the blows as the sound effects are so realistic and the fight action was so intense here it almost makes you nauseous. Camera angles follow the intrepid foursome so closely you could almost be getting a piggy back from Captain America. It ends with Scarlet Witch destroying a building in her bid to kill off the head bad guy as is now the norm with superheroes. But does that make them antiheroes after all Deadpool never hurt anyone in his pursuit of the bad guys. Meanwhile, Tony Stark (Iron Man, Robert Downey Jnr) is giving a speech to a hall full of University kids and showing off his latest technology where you can return to an earlier you and time and change things. He shows a moment with his mother and father, in a hologram type flashback where his father Howard (the always excellent silver fox John Slattery) says goodbye to him before he heads to the airport. The hologram of a CGI younger looking Downey Jnr reminded me so much of the younger actor that I loved in Chances Are (1989). Anyway after the speech, he confesses that he is on a break from his relationship with Gwynnie Pepper Potts. These superhero girlfriends seem not to hang around too long apart from Captain America’s who’s been around since way before every other girlfriend in the superhero universe and despite the fact she’s that old, Cap is still loyal to her. Aw. As he leaves Stark is confronted by a woman who tells of how the Avengers indirectly killed her son in Sokovia. The mysteriously accented Zemo (Daniel Brühl) is then seen torturing an upside down man over a sink quizzing him about the events of 1991. The man doesn’t disclose what happened, but after he is drowned. a book similar to the one read from in the flashback is found by Zemo and taken. We then attend a meeting where the Avengers – as mentioned so far – all meet up along with Vision (Paul Bettany) and some others. Stark brings the Secretary of State with himto the meeting. The Secretary of State, is played by William Hurt and not Sam Shepard as husband and I both thought as he entered the meeting. He shows – for the benefit of newbies and to refresh superhero aficionados memories – various Avengers news stories where they have killed the innocent whilst saving the world. He states the United Nations are bringing in new measures to monitor superheroes, and there will be imprisonment if the Avengers continue to work outside of these guidelines. This leads to a rift between Cap (Captain America) and Stark and the remaining Avengers take to the two opposing sides. Surprisingly, Stark sides with him due to his guilt over Ultron and Captain America challenges this and after a message from the grave confirming he is doing the right thing it causes the Avengers to take sides. So there I leave you, until I write a spoiler version or you see the movie. However I can tell you that although the longest Marvel Movie it feels like the shortest, as the storyline is so intense and riveting and the ending ties up the film nicely. I advise you not to arrive late, go to the toilet or eat popcorn as every scene is important in a little way towards the gobsmacking conclusions. Also this is as much a personal journey for Tony Stark as it is Captain America and Downey Jnr tugs the heartstrings to a T. As even more Avengers return, wee get nice wee reintroductions to them as characters and their recent storylines with in jokes for die-hard superhero fans. As they return you will be shocked as once good friends often apologise before they fight each other verbally or physically. It was lovely seeing Hawkeye (Jeremy Renner) and my favourite superhero Antman (Paul Rudd) for their short but effective appearances bringing in the humour this movie needed. Black Panther (Chadwick Boseman)- who I’d only met via my stepdude’s Lego console game – and his origins story is told briefly without labouring it out. There is some surprising romance, which is a more shocking, but leads to some humour and the reaction to this shows that superheroes are just normal men (in costume). And a few wee cameos. Spiderman (Tom Holland) returns with his Aunt May and both were a treat, with Spiderman almost like a PG Deadpool with pop culture and a few little pc Deadpool references shared for a younger audience. Aunt May – Marisa Tomei – was equally a delight as she met and flirted with Tony Stark to almost predatory cougar proportions. The chemistry between Tomei’s Aunt May and Stark was so apparent, I’m hoping this will lead to a new romance for the recently single Iron Man for the upcoming Spiderman Movie. I for one would love this, as then Spidy can concentrate on saving the world without the hindrance of the girlfriend Jane. I felt this character was spoiled by the writers of Spiderman 3 (2007) (or the Spiderman, The Kirsten Dunst Musical as we call it in this household). Not only does she seem the sort of lady who would love and approve of his Iron Man costumes, Iron Man looks like he’d heal from the Peppered criticisms from his recent uncoupling. 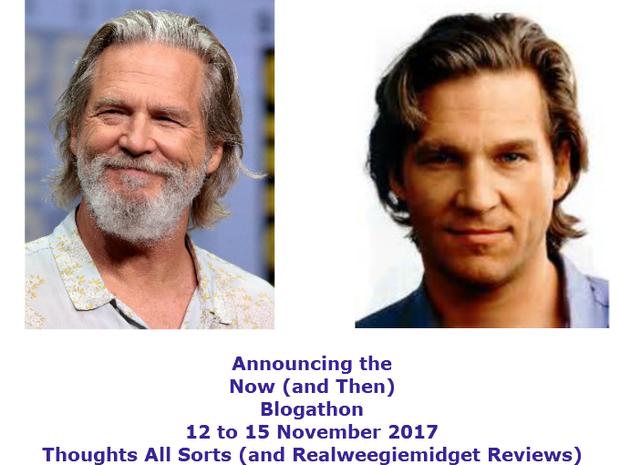 This post was added to my joint blogathon with Thoughts All Sorts in the NOW category. Other reviews with this cast include Robert Downey Jnr in Chances Are and Less Than Zero. Jeremy Renner features in my Arrival review. William Hurt was written about in Ai Artificial Intelligence and Paul Rudd in Antman. Scarlett Johansson stars in my Hitchcock and Lost in Translation posts. Great review. This Gives me a movie to watch with my grandson that I really want to watch. LOL. I wondered why they called it, Civil War! Be great to see which side you settle on, Marisa Tomei is good fun – don’t blame her character really ! We are going to see the film this week – my husband is a big Marvel fan! I too am a fan of Hawkeye and Ant Man! Hope you enjoy it, it’s like a who’s who of Marvel movies! No spoilers – if you read my 2nd Star Wars and Spectre reviews they are spoiler full!